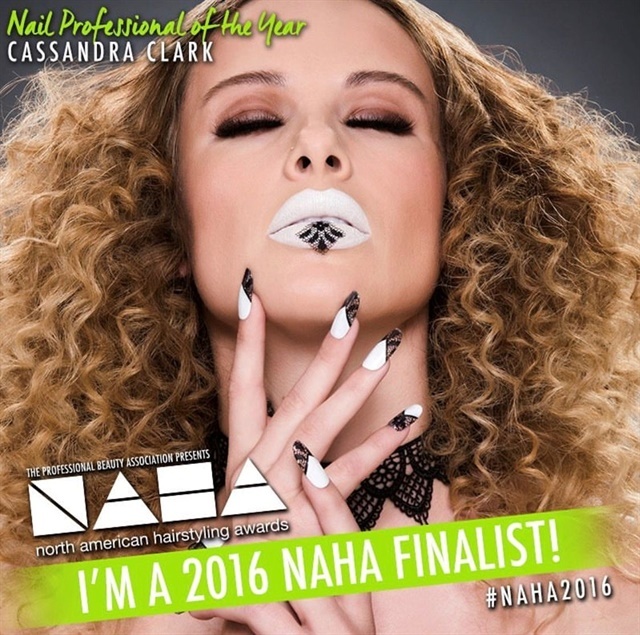 While in Long Beach for ISSE, I had the privilege of meeting Sandy Clark, a talented nail professional who has competed in the NAHA nail category several years in a row. 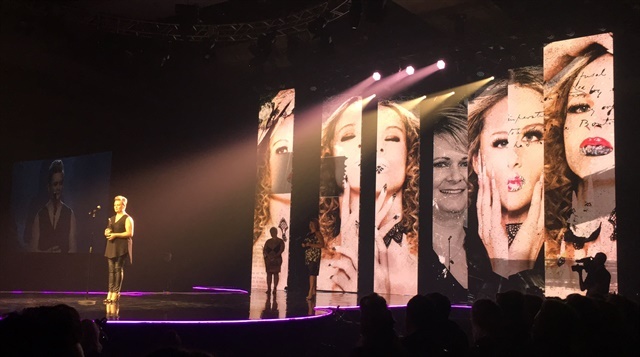 If you would like to vie for the 2019 Nail Professional of the Year title, now is the time to start brainstorming and beginning the process of creating your entry. Entry information for NAHA 2019 will be posted at www.probeauty.org/naha in May. Sandy had some wonderful suggestions for how to enter and tips on what to do to make your entry more likely to be successful. She has been kind enough to share all of this with you! 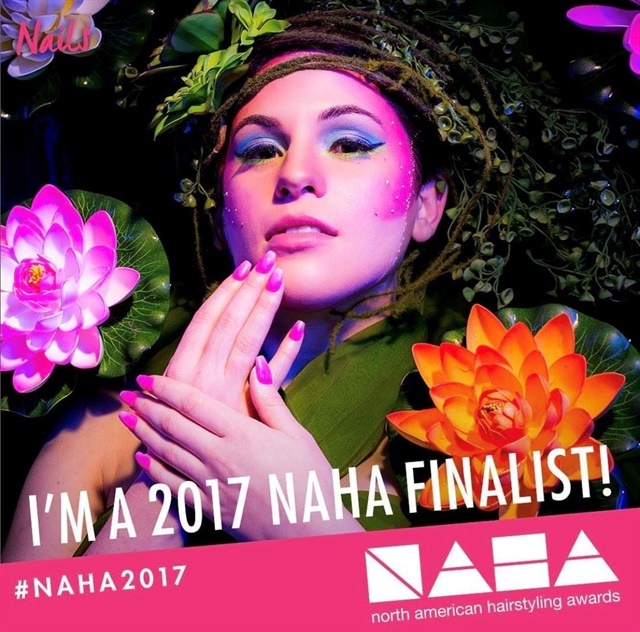 Are you interested in entering NAHA, but aren’t sure how to get started? 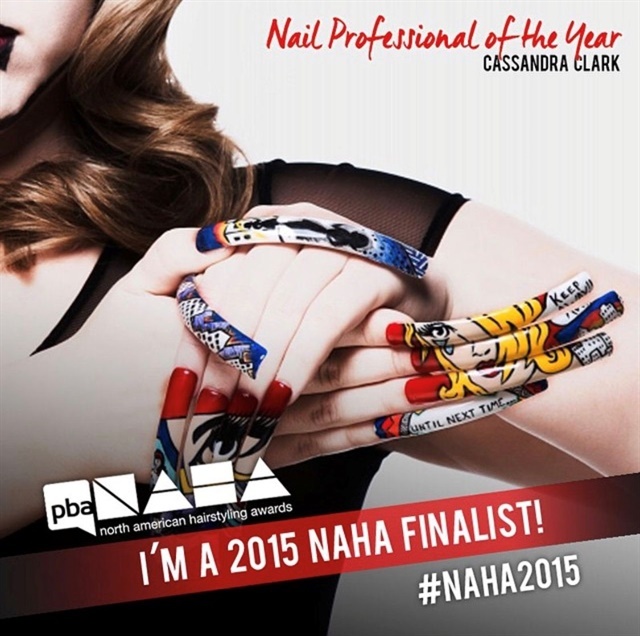 Putting a collection together to enter the Nail Professional of the Year category can be daunting. However, there are a few things that I’ve learned over the years that I’d like to share with you in order to help you through the process. 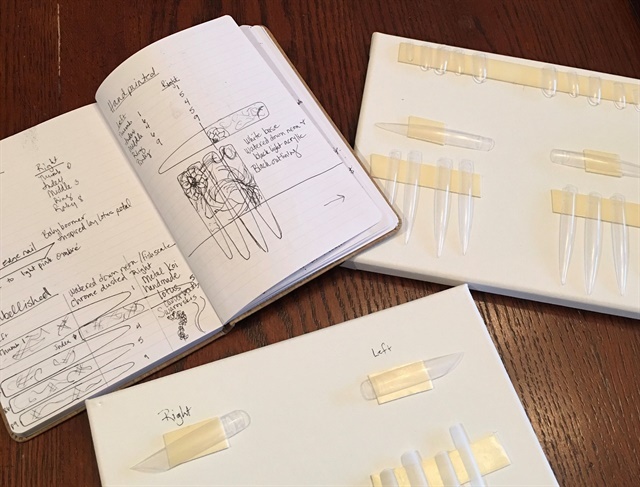 Every entry starts with an idea or inspiration. Do you have an idea? It’s time to brainstorm! Whether in a digital format or on paper, put a storyboard together. It may consist of nail design sketches, color swatches, and any element that has inspired the concept. Doing this will help you bring your collection into focus. 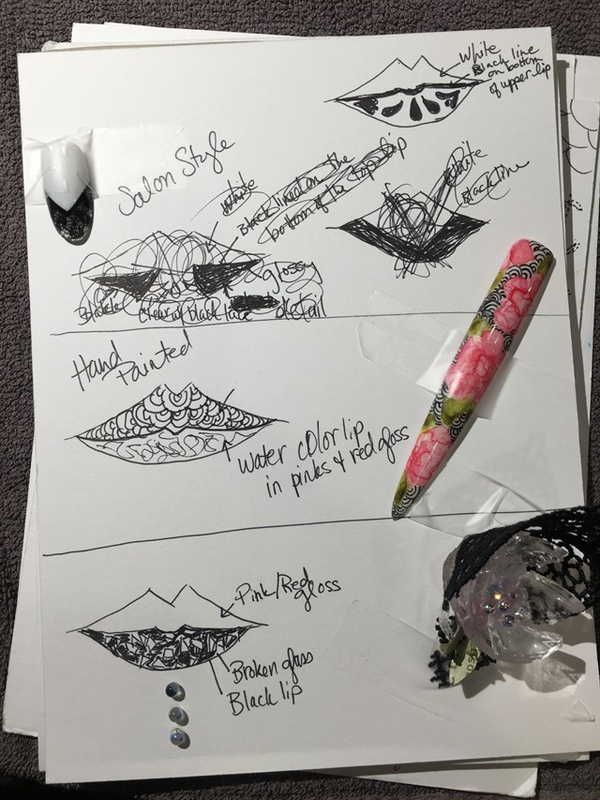 While the focus of your collection is on the nails you designed, remember that your images should demonstrate the harmony between hairstyling, makeup art, and nail artistry. Choose stylists and makeup artists you can depend on to help make your vision come to life. It’s very important to keep the overall look in mind. Choosing your model or models is very important. Will you choose one, two, or three models? That depends on your design. Your decision will affect how you choose to execute your designs, how much support you need for hair and makeup, and the organization of the photo shoot itself. Regardless of how many models you choose to work with, make sure you find models who know how to model. Another key factor is to find someone who not only has a compelling look, but also has appealing hands, fingers, and nail beds to work with. Choosing the right photographer is vital. You need someone who has experience in editorial photography. I cannot stress this enough. A high-quality photo shoot along with high-quality editing is so important. This is a photographic competition! By the way, expect the photo shoot to take at least five hours to complete after hair and makeup. Depending on what you plan to do, chances are you’ll need to prepare nails ahead of time to use as press-ons for the shoot. Have your model or models come in to fit their nails prior to starting the work. 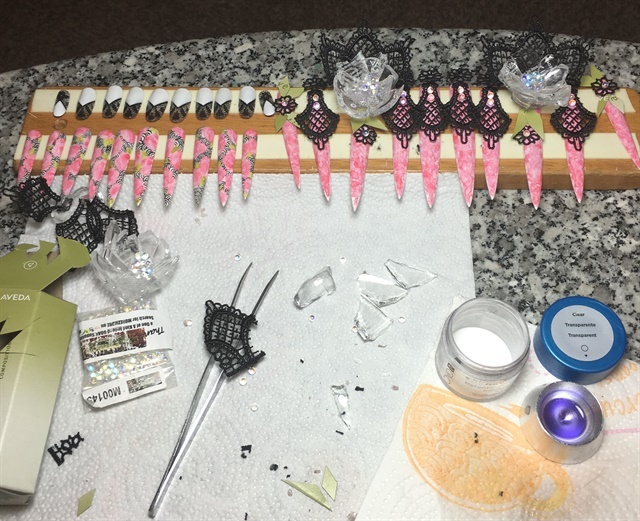 Expect the process of executing your designs and completing all of the nails to take several hours per set, depending on your hand-painted design and the amount of fabrication needed for the embellished set. Before fully planning your shoot, dig through the NAHA Winners and Finalists gallery. Look through the nails category of course, but also study the images in the various hair and make up categories. This will help you get a feel for what a NAHA judge is looking for in a top-five entry. And by all means, carefully read through the category rules and expectations! Your images must collectively tell a story. The collection should be consistent. It should be clear that they belong together even though each image should be strong enough to stand on its own. With all that said, remember to have fun with it! No matter what happens, you will have expanded your skill set, discovered abilities you didn’t know you had, and you’ll have great images to add to your portfolio.